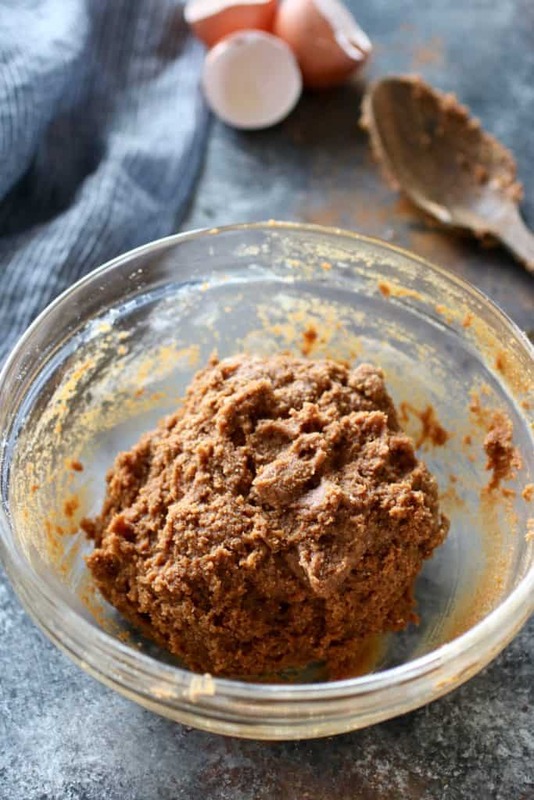 Paleo Soft-Batch Ginger Molasses Cookies are sweetened ever so lightly with coconut sugar and molasses. They’re the perfect holiday treat and with only 5 grams of sugar per cookie, you could even enjoy them as part of a healthy breakfast! Cookies made with less sugar for the win! During the holidays, it’s easy to lose track of your diet, eat more sugar than you normally do and skimp on nutritious veggies. I’m guilty of all of the above! From weekend baking parties with your gal pals, church cookie walks and exchanges to co-workers bringing in their irresistible homemade caramels and holiday parties that include massive platters of sweets, the temptations are all around. In fact as I sit here writing this post I’m surrounded by treats! First, there’s Slow Cooker Spiced Nuts sitting within arm’s reach. Then, I’ve got these Paleo Soft-Batch Ginger Molasses Cookies (which I’ll be enjoying with a cup of coffee here soon) also within arm’s reach. And let’s not forget about the Buckeyes (Peanut Butter Balls) that are seemingly staring through my fridge taunting me to just open up the fridge and eat just one! My point is not that you can’t enjoy these delicious treats that come around this time of year, but rather that this is so many more treats than I normally have on hand…and my guess is that you might be in the same boat. This is exactly why Jess and I are excited to be sharing with you some healthier holiday treat options that you can add to your mix of goodies. Options that are made with health in mind, real food ingredients, and less sugar. 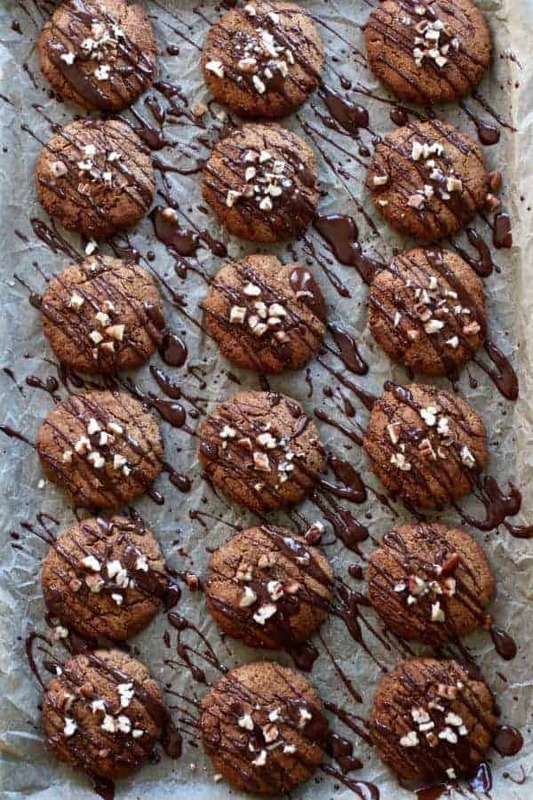 Treats and cookies CAN be made healthier and taste equally delicious! Now don’t get me wrong, there are some recipes that I don’t mess around with: Grandma BK’s Kringla and Grandma Verna’s Peanut Brittle. These recipes will always be made as written and will always be enjoyed without an ounce of guilt because they’re filled with childhood memories and family traditions. With that said, if there IS a recipe that I can tweak to reduce the sugar, make them refined-sugar free, substitute the white flour for something a little healthier like coconut flour or almond flour and the outcome is equally delicious, I absolutely will! 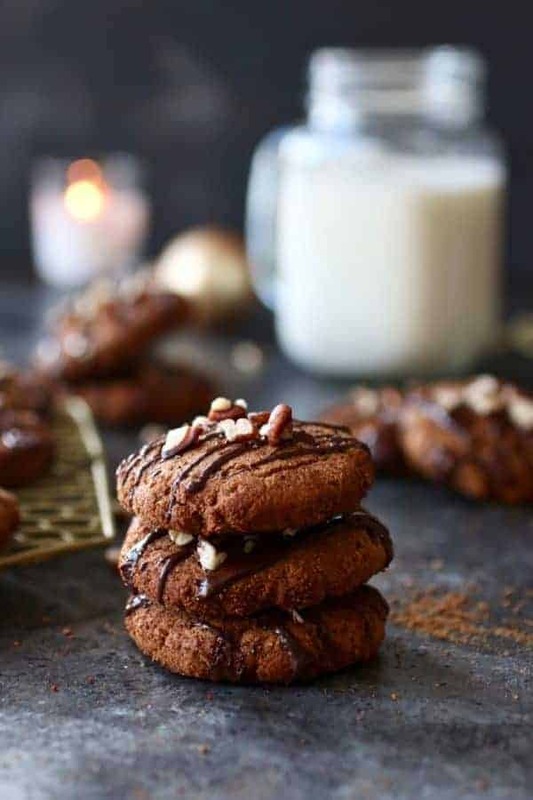 Which brings me to sharing with you one of my personal favorites, these oh-so-scrumptious Paleo Soft-Batch Ginger Molasses Cookies. You are in for a treat, my friend! 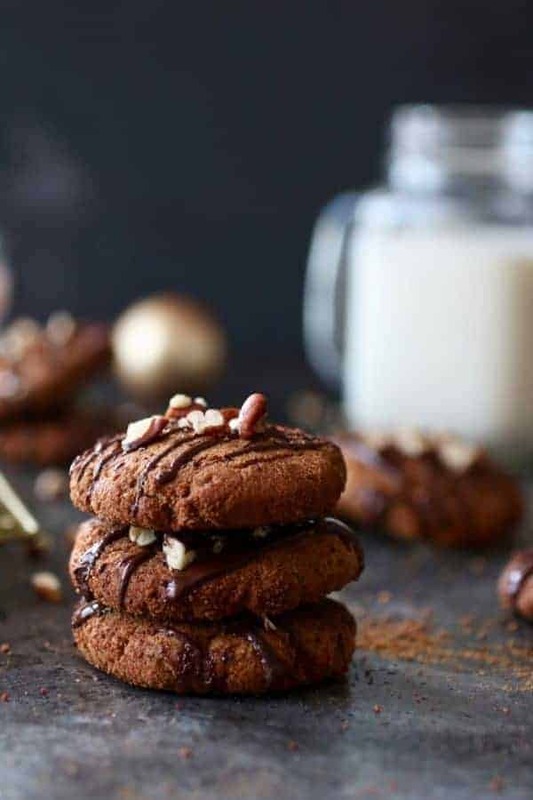 Paleo Soft-Batch Ginger Molasses Cookies are gluten-free, made with a blend of coconut flour and almond flour, sweetened lightly with coconut sugar and molasses and made complete with cashew butter, cinnamon and ginger. The mouth-watering aroma they give off when baking will instantly put you in the holiday spirit (if you’re not already). You can drizzle them with a little chocolate and top with crushed pecans if you wish. 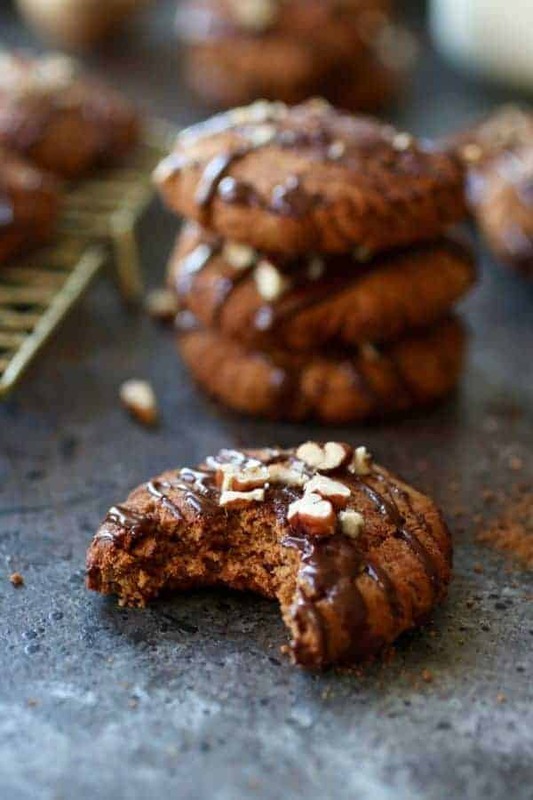 Get ready to sink your teeth into this decadent, soft and fluffy cookie that’s complete with the flavors of cinnamon-y, ginger, and molasses goodness. Is your mouth watering yet? 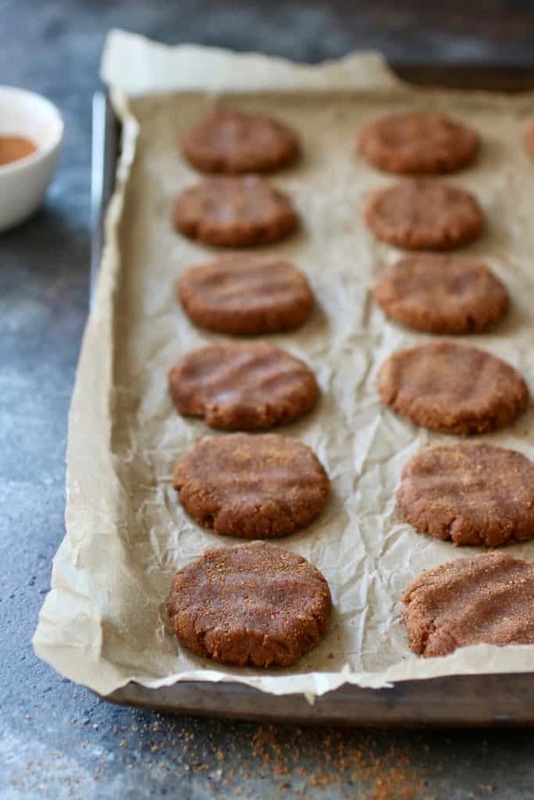 I can’t wait for you to give these Paleo Soft-Batch Ginger Molasses Cookies a try! 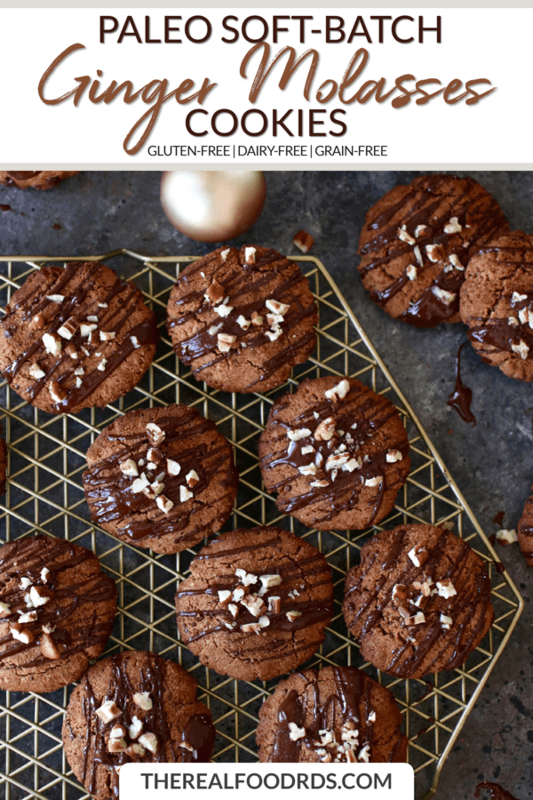 They’re the perfect healthier holiday treat for your upcoming parties and gatherings or to simply enjoy with a cup of coffee in front of your beautifully lit tree (exactly what I’ll be doing in the days to come). 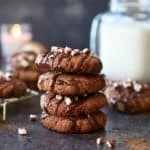 In addition, these cookies also make for a tasty accompaniment on a Christmas morning brunch or breakfast menu and because there’s less sugar, they also make for a fun after-school or lunchbox treat for the kids. Lastly, these cookies are freezer-friendly so feel free to make them ahead and enjoy in the weeks to come. 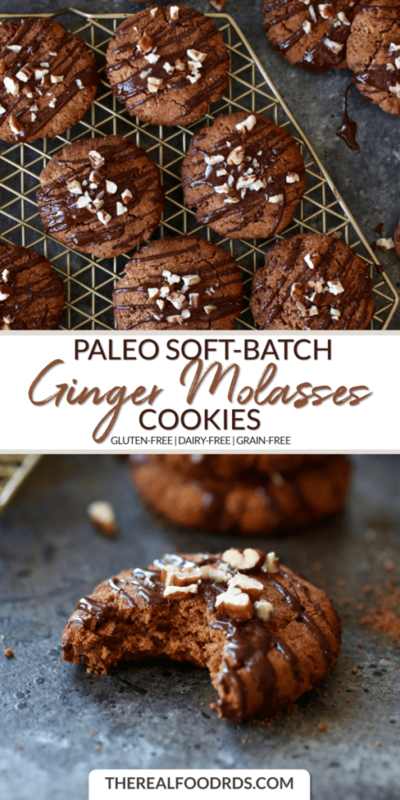 Give these Paleo Soft-Batch Ginger Molasses Cookies a try and let us know what you think in the comments below. And as always, with any of our recipes that you make and post a photo on social, don’t forget to tag @therealfoodrds so that we can see what you’re whipping up! 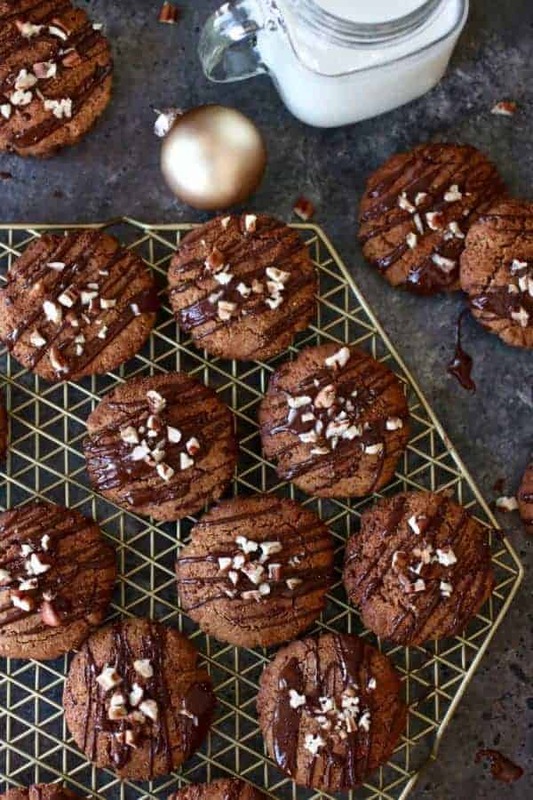 Looking for more cookie and sweet treat recipes for the holiday? Try our Peppermint Brownie Batter Truffles, Holiday Spiced Pecans or 3-Ingredient Chocolate Mint Cups. Preheat oven to 350ºF. Line a baking sheet with parchment paper. 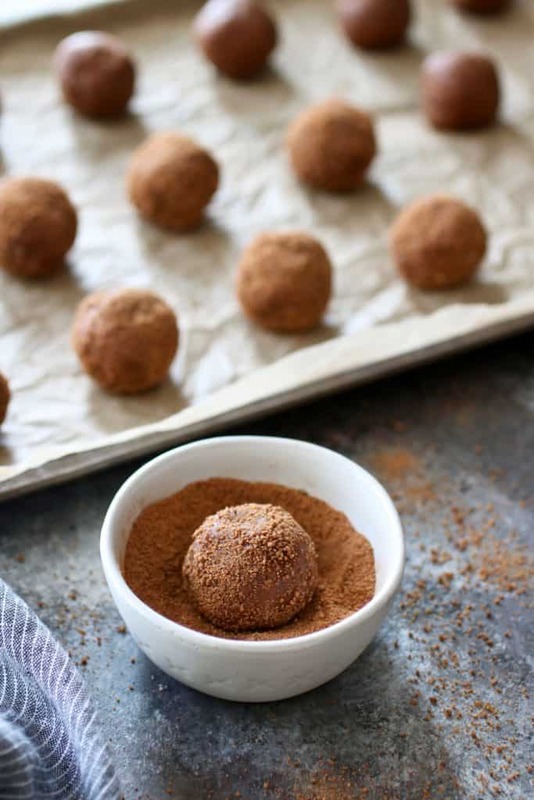 In a medium bowl, mix together the almond flour, coconut flour, cinnamon, ginger, baking soda and salt. 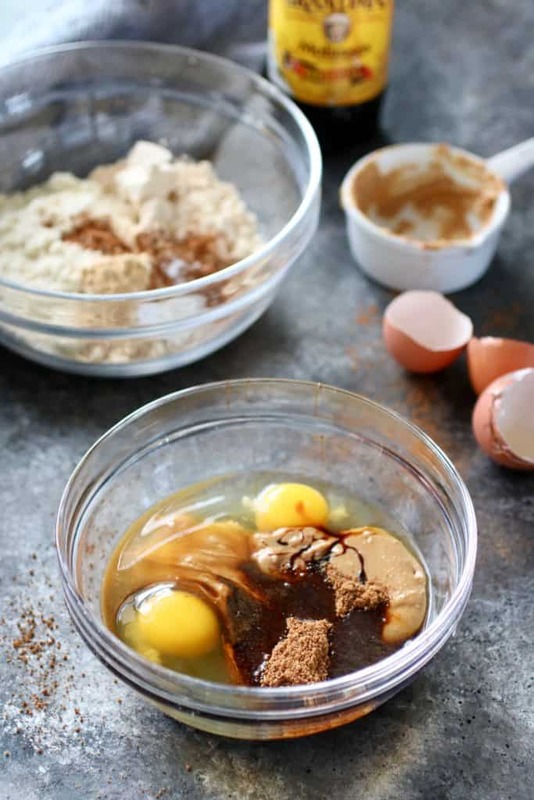 In a small bowl, whisk the eggs, cashew better, coconut oil, molasses, coconut sugar and vanilla extract together until smooth. Then add to the flour mixture and stir until well combined. Dough will be slightly sticky. Place dough in fridge for 15 minutes. Meanwhile combine the ingredients for the coconut sugar coating. With hands, roll chilled dough into balls about the size of a golf ball. Next, roll each dough ball into the coconut sugar coating. Transfer sugar-coated dough balls to the baking sheet and press down gently to flatten (about 1/4- to 1/2-inch thick). Remove from oven and transfer to wire rack to cool. Enjoy warm or save for later. Optional: Drizzle with melted chocolate (1/3 cup chocolate chips + 1/2 tsp. coconut oil) and top with chopped pecans. Store cookies in an airtight container for up 2 weeks in the fridge or 3 months in the freezer. Greetings! Your directions say to add nutmeg but, your ingredient list doesn’t have it listed. Do we need to add nutmeg? If so, how much? No nutmeg needed. Recipe has been updated. Thank you for catching that. This is so amazing – thank you for commenting and leaving your 5-star review. We really appreciate it!! Unfortunately, because coconut flour is so unique we can’t suggest a substitution without having first tested it. Hi there!! I just wanted to leave a quick note regarding this recipe. It is awesome. Soft and chewy. I did add a scoop of collagen to the mix and it didn’t affect the quality of them at all. Good job! And thanks for sharing.